This is 298 yards of singles from 3 oz. 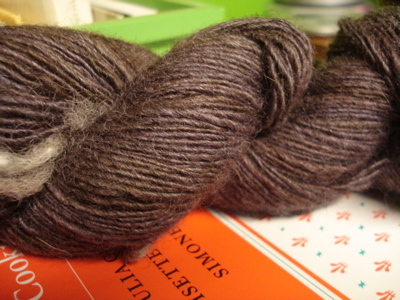 of black bfl in the Manka’s Thicket colorway from AVFKW. 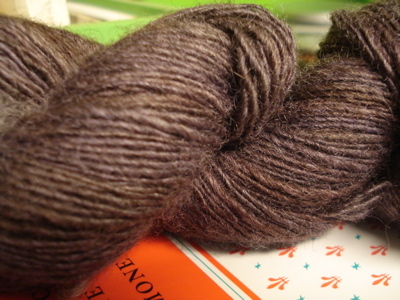 (Again, this fiber is gorgeous, with hints of reddish purple throughout the naturally dark wool. My photography skills are seriously lacking when it comes to capturing colors like these.) Using this as the main color for a daybreak shawl, I could make the medium size. I don’t quite have enough of the Sadia bfl for this size, but I have enough similarly colored fiber that I could spin an extra 4o yards of that if and when I run out. I am excited about this project — this might be the first time I’ve spun with a specific pattern in mind. 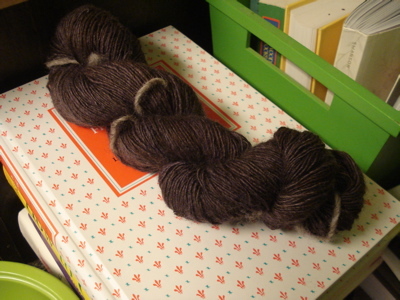 I’m also really pleased about the relative consistency of my singles — I got 203 yards of singles out of 2 oz. of the Sadia bfl, and 298 yards out of 3 oz. of the Manka’s Thicket black bfl, which says to me that on the whole, these skeins are relatively similar in weight/thickness. Hooray! Grey and rainy here today, which is good for my farm share, right? This entry was posted in spinning and tagged AVFKW, black bfl, daybreak, FO, manka's thicket, singles, spinning by barefootrooster. Bookmark the permalink. So gorgeous! And I agree, they’re nice and even. Nothing beats BFL for sheen in my book.